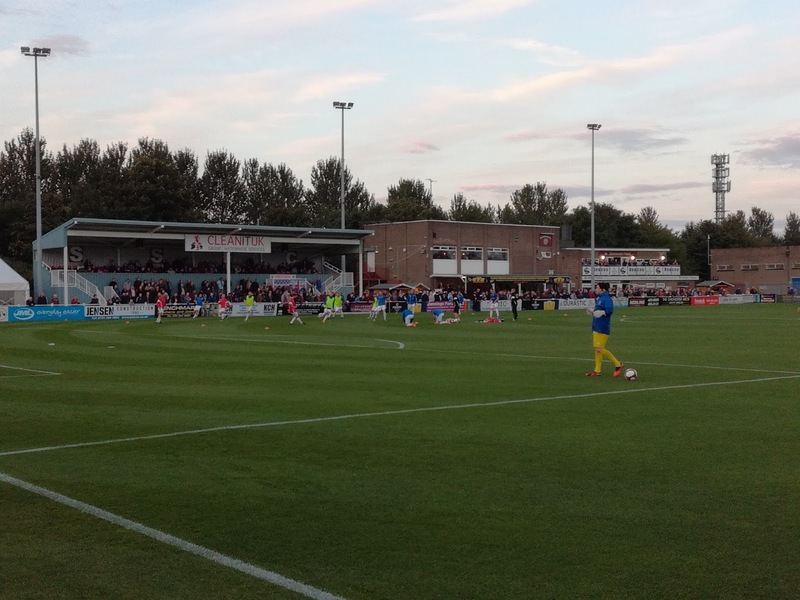 I’ve been trying to think of a word that best describes South Shields Football Club, and it's proving quite tricky. To truly understand one of the remarkable tales of the modern era, you have to delve a bit deeper into the history books to really begin to chart the ups and downs of a club that is really starting to make people across the land sit up and look. Elected members of the Football League in 1919, the club prospered until 1930 when with the threat of bankruptcy hanging over them, they moved to Gateshead and took on their name, in what some might argue was an early version of the MK Dons scenario, albeit over a significantly shorter distance! A new club was formed in South Shields and they carried on in the North Eastern League’s until 1968 when they were invited to become inaugural members of the Northern Premier League. This is where they stayed for six seasons, and at one point they reached the Third Round of the FA Cup, losing out to Queens Park Rangers. Not only that, they also reached the semi-final of the FA Trophy, losing out to Morecambe. It all went pop though in 1974, when the club were once again forced to move to Gateshead and change their name, largely due to the controversy and mysterious loss of the ground at Simonside Hall, and to this day there remain unanswered questions surrounding that episode. 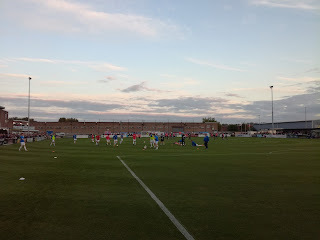 A new club once again emerged, and success followed in the Northern Alliance and Wearside League’s until 1995, when the acquisition of Filtrona Park allowed the club to be admitted to the Northern League. Promotions and relegations between the two divisions of the Northern League followed, along with a worrying period of two seasons when they vacated Filtrona Park due to the lease expiring. However, they returned home in 2015, and that’s when the landscape changed dramatically. Geoff Thompson took over as Chairman and in his first season, they won the Second Division of the Northern League. Last season they went on to win the First Division, along with the FA Vase, and now they find themselves in the Northern Premier League, 43 years after leaving it. But this is the thing, the records being created on and off the pitch are quite staggering. 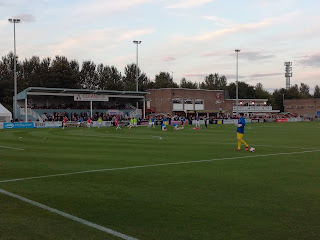 Last Saturday, the win at Witton Albion in the FA Cup was the club’s 29th successive away victory in all competitions. 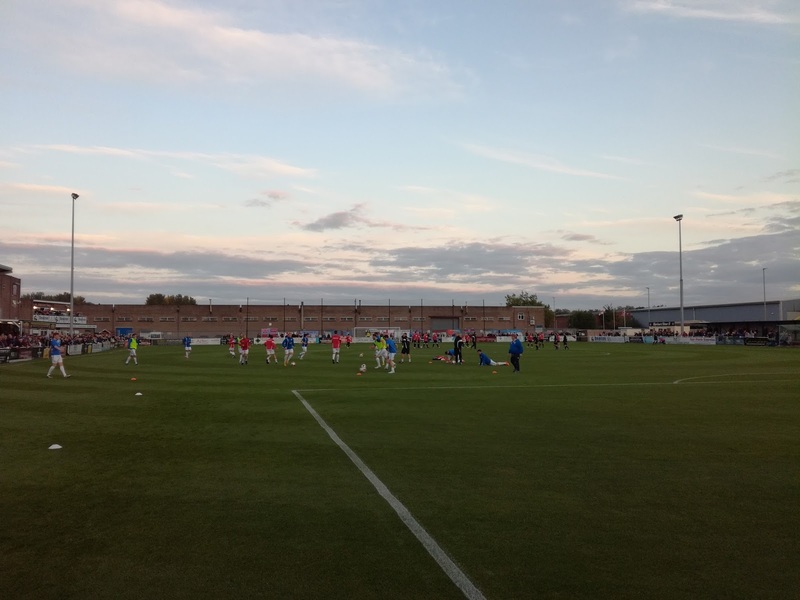 Prior to tonight’s game against Ossett Albion, the club had won 43 of its previous 44 games. These stats are scary, we are talking semi-professional football, and this is why I use the word 'phenomenon', in the sense that it surely has no equal? 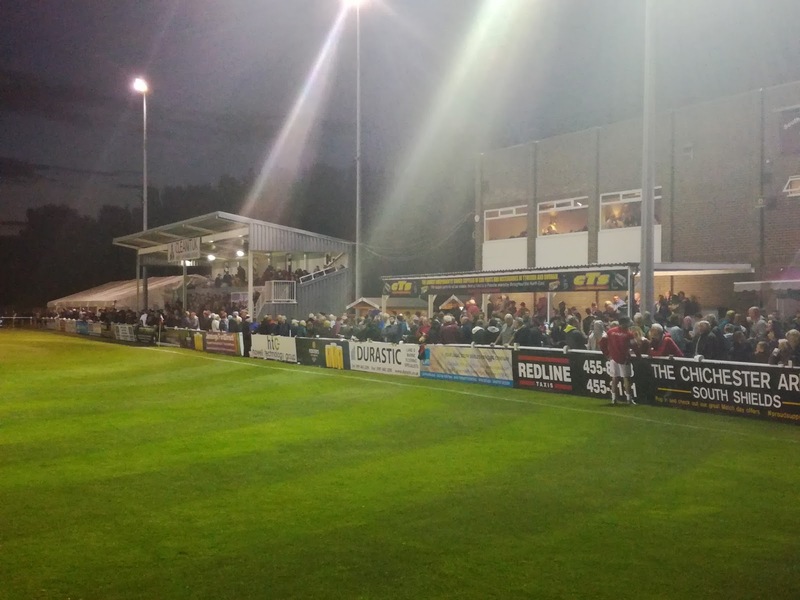 Off the pitch, the crowds are flooding in, in the season they won the Second Division the average crowd was 698, last season they averaged 1275, and this season it’s risen to over 1500. When they went to Wembley in the Vase over 10,000 made the journey. The talk of the pre-war years was that South Shields could maintain a top flight professional football club, what is now happening in the eighth tier of football is suggesting that the professional ranks are not out of the question, in what is a vastly different World altogether. 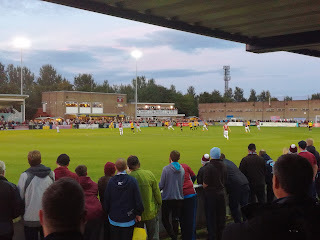 I simply had to go and have a look at this, and in fairness despite the distance, it was a relatively easy journey up the A1 to the Tyne Tunnel exit, followed by a short hop to what is effectively the border between South Shields and Jarrow to the ground now known as Mariners Park. 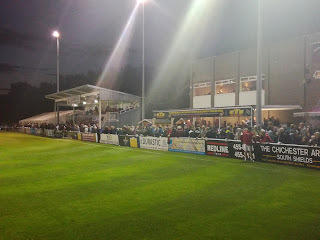 Mariners Park sits at the end of a road that is dominated by industrial units, and even an hour before kick off it was busy, I chose to park in a unit five minutes walk away, and at this stage there were queues to get into the ground. The first thing that strikes you when you walk into the ground is the outstanding playing surface, complete with inbuilt sprinkler system. To call it a billiard table would not be doing it justice. The stadium itself, while not a spectacular new-build with mod cons and the like, is a very neat, tidy and functional venue. 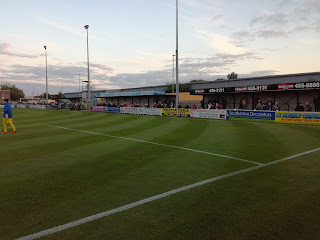 As you enter, to the left are three sections of Atcost terracing that run from one end of the pitch to the other, both ends of the ground are open, one of which has the all weather pitch behind it. Opposite is the tall main stand, in front of which is an area of terracing, while to one side is a large beer / hospitality tent, and to the other are a couple of buildings housing dressing rooms, bars and function suites, along with a further smaller area of covered terracing. I lost count of the number of bars and food outlets, but clearly you weren’t going to go hungry or thirsty, despite the large crowds. As a venue, it ticks the boxes, and it’s clearly well looked after. The organisation was good and the officials friendly and helpful, I guess you really couldn’t ask for any more. So what about the phenomenon that is the team? To put it simply, they play with a confidence that allows them to pass the ball almost instinctively either long or short, cross field or diagonal. They intuitively know each other’s movements and can very quickly move the ball in tight spaces, at times it was a joy to watch, and in fairness to Ossett Albion they had to accept they were going to have long spells without the ball, trying to defend and keep their shape. Orchestrating the whole event is Julio Arca, the former Sunderland and Middlesbrough player sits just in front of the back four and pulls the strings. Tonight, while not the standout player, he was a joy to watch. If there is a more accomplished footballer at this step anywhere in the country I’d like to see him. It was 0-0 at half time and that was largely down to poor finishing from Shields, however almost straight from the off at the start of the second half Jamie Holmes angled a low drive into the net. Louis Storey then scored a second from a header only for Callum Charlton to pull a goal back after a brilliant cross from Declan Dawson. Breathing space was restored in the 79th minute when Holmes found space in the box and beat the visitors keeper from a tight angle. It was a thoroughly deserved victory for Shields who played some delightful football, and I suspect without really hitting top gear. But with now 44 wins from 45 games, who am I to be remotely critical? So what does the future hold? I’ll be bold, they’ll win this league, and then they’ll probably have enough to win the Premier Division, but then once in National League North the ante increases substantially. That’s a league that I would describe as a real bottleneck, with so many big and powerful clubs vying to get into the National League. Just look at who they would be potentially up against, the likes of Darlington, Salford City, York City, Stockport County, Boston United and Telford United. This is a mammoth division to escape, but would I bet against National League status being achieved at some point in the not too distant future? No I wouldn’t. So, that’s why I use the word ‘Phenomenon’, a once big name, who sank into the doldrums, and then came back to achieve success and support that those on the outside would not have thought possible. But that’s where men like Geoff Thompson come into the equation. They sing a song at Mariners Park about him having a dream, but I don’t think Geoff’s dream has quite ended yet, and for the 1,500 regulars and those who will no doubt jump on the rollercoaster in weeks, months and years to come, they too will be hoping that dream continues. Thanks for an excellent article Neil. Superb objective viewpoint on our club. And you didn't even see the best eleven on the pitch: Shaw, Cogdon, Morse and Baxter were sitting on the bench, and club legend Barrie Smith was unavailable!!! Hope to see you again soon. Look us up on facebook: search fro All Things Mariners.